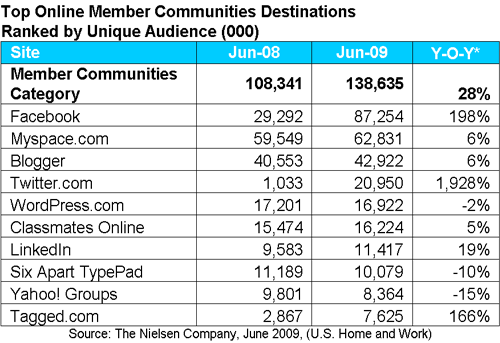 Nielsen’s June 2009 Social Media Stats reports continued online member community unique audience size growth for the seven of the top ten largest social media sites. Twitter posted the largest year over year growth rate of 1,928%. Among the top 10 social media sites, Twitter.com was again the fastest growing, increasing 1,928 percent year-over-year, from 1 million unique visitors in June 2008 to 21 million unique visitors in June 2009–making Twitter the fourth most visited member communities site in June. Facebook continued to lead as the No. 1 U.S. social networking site for the sixth month in a row, with 87.3 million unique visitors in June 2009. Although Twitter’s audience reach grew the most, Facebook’s audience penetration remained the highest @ 4:39:33 spent on the site. 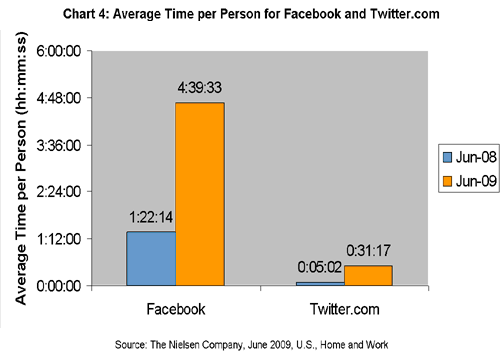 Both Facebook and Twitter saw increases in the average amount of time spent per person by their respective audiences. Facebook was also the No. 1 social networking site among the top 10 when ranked by average time per person, with visitors spending an average of 4 hours and 33 minutes on the site in June. This is a 240 percent year-over-year increase. The average time per person on Twitter increased 522 percent year-over-year, from 5 minutes and 2 seconds in June 2008 to 31 minutes and 17 seconds in June 2009, making it the fastest growing by time per person among the top 10.